Judge Roy Bean, operating out of Langtry, Texas was the self-appointed justice of the peace, referring to himself as the "Only Law West of the Pecos." Though his methods of justice, carried out in this combination saloon/courtroom were somewhat odd, they were always final. In addition to Bean's colorful "justice" meted out in his saloon, patrons could also enjoy billiards and "opera house" productions. Both the village of Langtry and the original Jersey Lilly Saloon were supposedly named in tribute to the English actress Lillie Langtry, with whom the judge was infatuated. Though they never met, she did visit the saloon in 1904, shortly after the judge died at the age of 78 following a drinking spree. 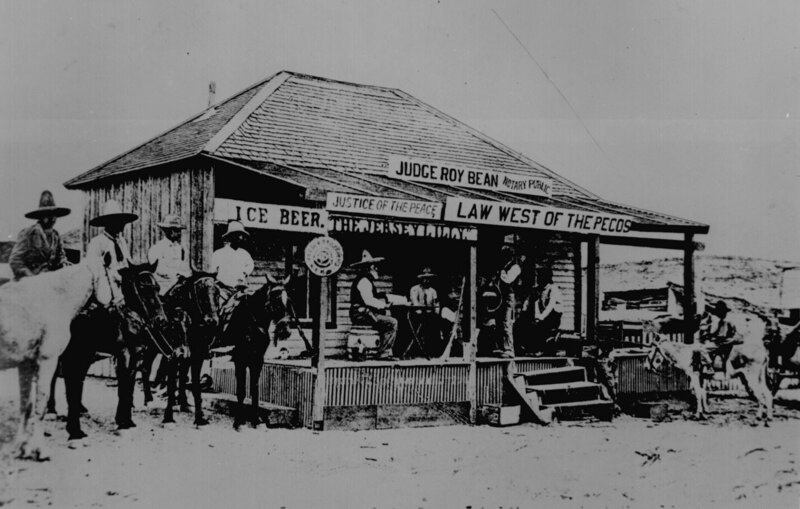 Today, the Jersey Lilly Saloon and Courtroom adjoins a Visitor's Center in Langtry, Texas that interprets the highlights of Judge Roy Bean's career and provides travel information for the Lone Star State. Langtry is all but a ghost town today.